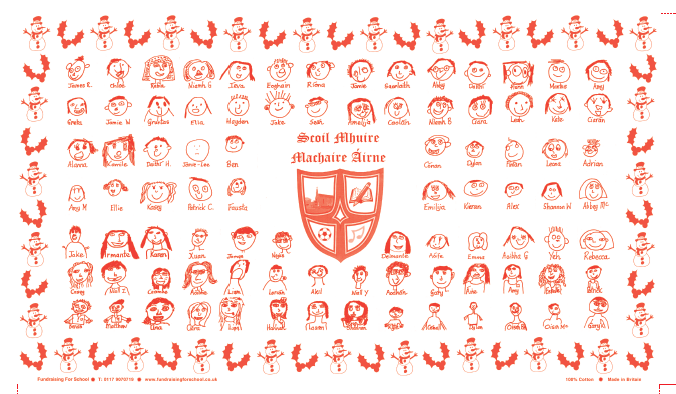 This year as a Christmas project the School Council were very creative and decided to design a school Christmas Tea Towel that would show all the children in our school community of Scoil Mhuire, Magherarney. Firstly we did the sums! working out what potential orders there might be and what quantity of tea towels we would need to order. The amount we ordered would have an impact on the cost of the tea towel to print and in turn the price we could charge for the tea towel. Each child had to draw a mini portrait of their face and Ms Payne then laid out the faces on a template given to us by the printing company. The council also got to pick the type of Christmas border we wanted around the edge of the tea towel. Unfortunately our colour choice for printing was not possible and we had to have a meeting to decide would we go ahead with the project or not. We took a vote and decided to continue with the idea and try and have the tea towels ready for Christmas as we thought they would make a great Christmas present for friends and family. Our tea towels cost €5 and they arrived on the day of our Christmas Holidays thanks to the Chairperson of our Board of Management who took delivery of them. They were an immediate hit and sold out! Now many houses around Smithborough are lucky enough to see all our smiling faces every day! 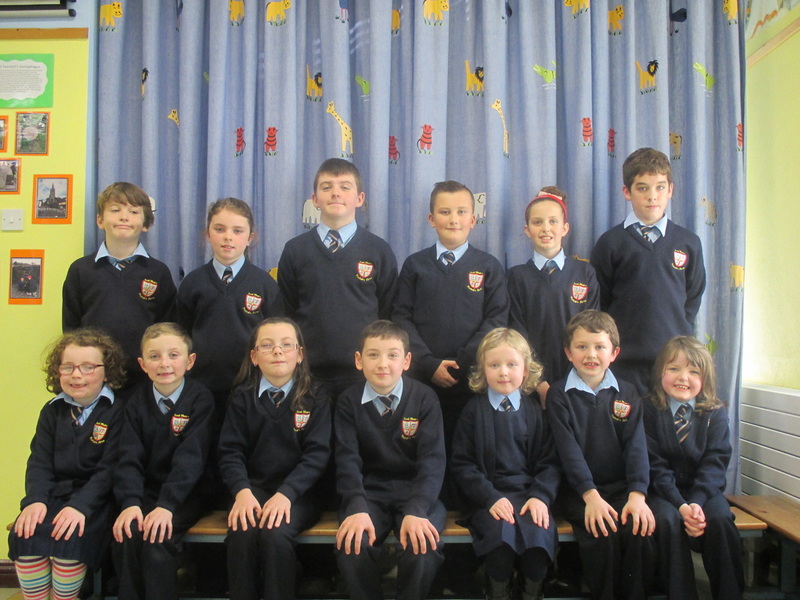 This year October 2014 saw the election of a complete new School Council to represent the pupils views and opinions in Scoil Mhuire, Magherarney. A great interest was shown in the elections and impressive speeches were made by all candidates. Ballot papers were collected and our school secretary counted and recorded the tallies. The following pupils were elected and offices were decided upon at the council's first meeting. PRO: Aodhán Boylan, Estelle Lambe, Patrick Lambe. The newly elected committee began it's term of office by completing the School Councils Constitution. Our constitution can be downloaded at the top of this page. It will inform the practice of all future councils and will explain to you how our elections and meetings are run. Our first project this year has been the production of a School Council Calendar for 2014. Each classroom has produced three pieces of art work for the calendar. Every child's birthday appears on the calendar making it a great Christmas present for all those Grannies and Grandads and Godparents, as these are indeed very important dates for them to remember! Our calendar goes on sale on December 10th and costs €5. Get your orders in quick before they sell out! 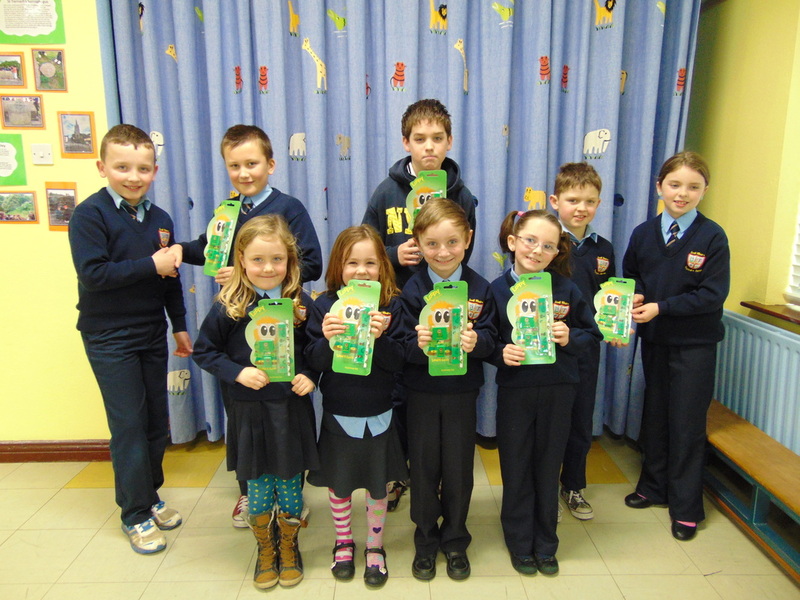 This year Scoil Mhuire's School Council organised four events to celebrate Seachtain na Gaeilge. The celebrations started with a Lá Scéalaíochta. Having all gathered in the school hall and dividing into teams, ranging from Na Naíonáin to Rang a Sé each classroom donned their storytelling caps and read a story aloud to the gathered teams. When finished teams answered a set of ten comprehension questions. The council also organised our annual Conair as Gaeilge which saw teams read and work out clues to locate information that would be used later in a decoding activity. The second week of celebrations leading us to Lá Fhéile Pádraig saw our annual Tráth na gCeist take place along with a new venture our Spelling Bee as Gaeilge. Congratulations to the successful teams in each event who were presented with their prizes by council members. Bhaineamar an-taitneamh as na himeachtaí go léir! 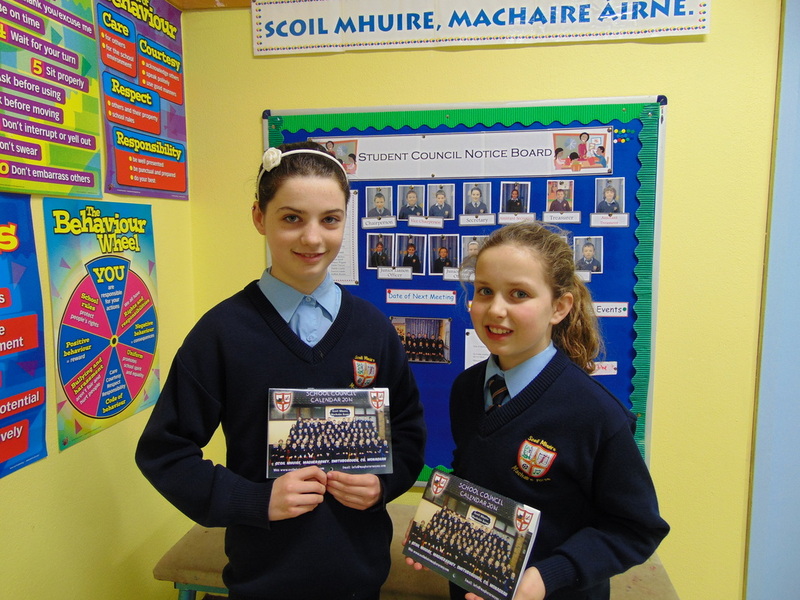 Scoil Mhuire held elections for its first ever school council in 2011. It proved to be a very memorable year with the council organising many events. One significant event was the council's work in co-operation with the school's Parents' Association on the design of our first ever school football kit. For many years the school was fortunate enough to avail of the local football club, Éire Óg strip and we will always be indebted to the club for their kind support. The council organised a competition for pupils to design a jersey. The infant classroom were given the task of picking colours for the strip. They chose green, to represent the school's green flag and the rolling green hills that lie beyond our school football pitch and gold to represent the sunny warmth of our school. 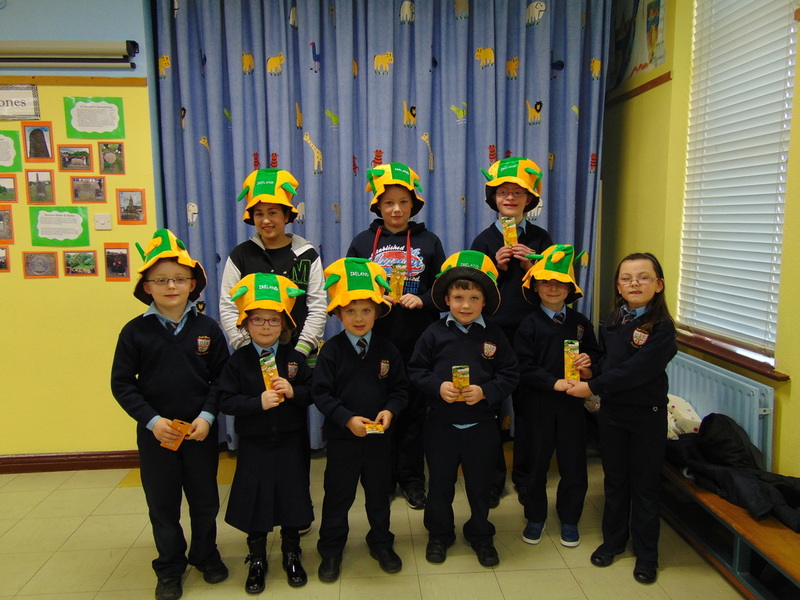 Children from first to sixth class then had the job of designing the jersey itself in the green and gold colours. A huge variety of designs flooded in showing great imagination and a fantastic sense of style! Each classroom was given a selection of designs from which they had to pick a finalist. In total four jersey designs made it to the final. The council felt it fitting that Mrs Cassidy, who retired in February 2012 and who had witnessed many of Scoil Mhuire's triumphant wins over her 32 years in the school, choose the winner from the four finalists. The four finalists; Chloe Mc Bride, Hazel Behan, Ciara McCaffrey and Laura Hughes were on tender-hooks that final day in February but there could be only one winner and Hazel Behan had the honour of seeing her design become the school football jersey. The School Council presented Hazel with her very own personal jersey which we hope she wears with pride for many, many years to come. 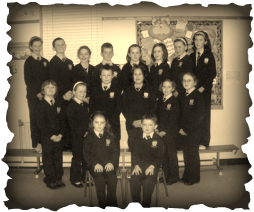 To end their first year in office the School Council of 2011-2012 held a 'Magherarney, You've Got Talent' show. Singing, dancing, musical interludes, comedic sketches and even magic entertained the very discerning audience of Scoil Mhuire pupils and staff. The panel of judges were aghast at the huge variety of talent on display and not a single red buzzer was pressed! 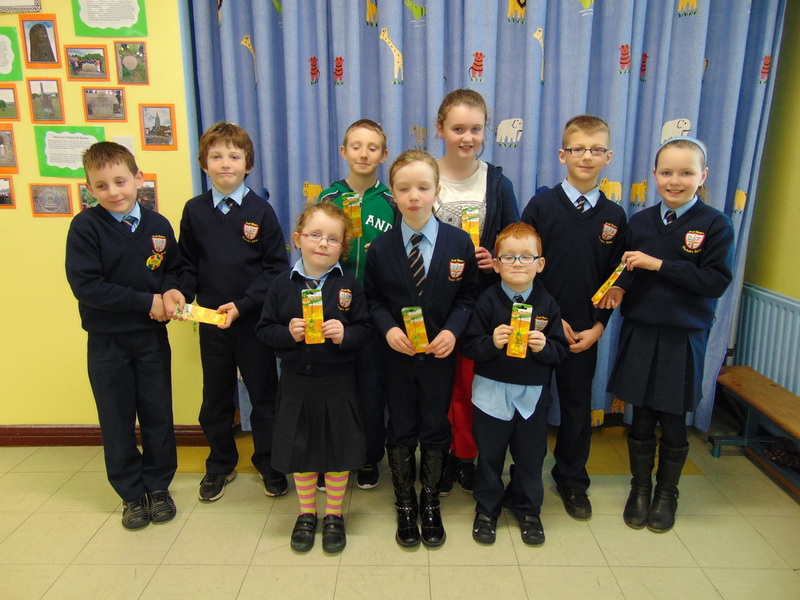 This year the School Council took responsibility for organising events for Seachtain na Gaeilge. We decided to incorporate team work, the great outdoors and Gaeilge by designing an outdoor trail 'as Gaeilge.' We composed a series of thirteen clues in Irish. Each foireann was made up of pupils from Junior Infants right up to Sixth Class. The older team members from third to sixth deciphered the clues and worked out the locations they were hinting towards. Once at the location the team searched for a picture of a coloured balloon with a particular number on it. The infants had to abair an dath as Gaeilge agus an uimhir and Rang 1 agus Rang 2 recorded these answers on the team's clipboard. Once all the teams had completed the trail it was back to the school hall where each team was given a sheet with a code on it. The older children used the numbers collected on the trail to decode a message 'as Gaeilge' while the infants used 'na dathanna' to complete a coded picture which had to be coloured according to the code! It was a lot of thinking as well as great fun and it was great to work with pupils from other classes. Agus ar ndóigh bhíomar go léir ag úsáid ár nGaeilge. The School Council also organised our annual Tráth na gCeist which we hold every year as part of our Seachtain Na Gaeilge celebrations. Again teams were made up of pupils from infants to sixth class and the ceisteanna varied to cater for all age groups. Bhí lá iontach againn! One of the objectives of this year's School Council is to provide each classroom with a selection of equipment that could be used at break times for outdoor play with the goal of increasing physical activity. We are lucky to have a good supply of equipment for P.E. lessons but to maintain this equipment in good condition the council have decided to purchase separate play equipment for each classroom. We hope to give each classroom a selection of skipping ropes, hula-hoops, a selection of balls and a basketball for the senior rooms. In order to raise some funds the committee decided to organise a 'Jersey & Bear' Day for all the pupils in the school. We raised a total of €93.00 and we are currently researching the best place to purchase the equipment in order to get good value for money! Have a look at some photos of our fun day.